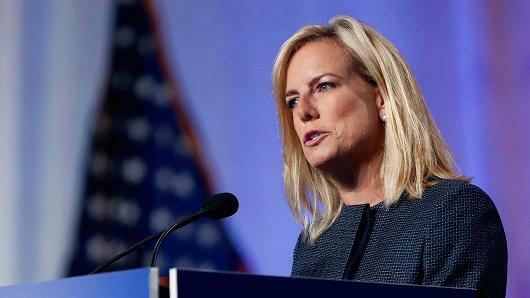 Homeland Security Secretary Kirstjen Nielsen has been accused of being somewhat soft on her boss's signature issue, not entirely without justification. But she is standing firm, so far, against the wave of hysteria accompanying family separations accompanying the administration's attempt to enforce the border. As she told the National Sheriffs' Association today, "We have to do our job. We will not apologize for doing our job. We have sworn to do this job." When you reward something, you can expect to get more of it. How to change the expectations of prospective illegal aliens? Stop rewarding them when they bring children along. This is what the administration has done. In resuming the Bush-era zero-tolerance policy at the border, the Justice Department is aimed at prosecuting every border infiltrator for the crime of "entry without inspection", a policy that even Sens. Flake and McCain vociferously supported when Obama rolled it back. But since children don't accompany their parents to jail, the critics of this policy are implicitly demanding that border-jumpers bringing children with them should be exempt from prosecution — a sure recipe for even more children to be smuggled through Mexico and to the Rio Grande. In addition to criminal prosecution (which results in only a few days in prison for first offenders) the other reason illegal-alien children are separated from their illegal-alien parents at the border is when the parent claims asylum. Only a small percentage of Central American illegals actually get asylum, but they've been coached by smugglers and anti-borders activists to make the claim anyway as a means of gaining entry to the United States. The government's choice at that point is to detain the parents and put the children in a shelter (because of legal prohibition on keeping children in detention for more than 20 days, even with their parents) or to release the whole family with a notice to appear, which they will ignore, disappearing into the illegal population. Again, the critics of current policy are saying that bringing a child with you when you ask for asylum should exempt you from detention, i.e., give you access to the United States, after which you disappear.